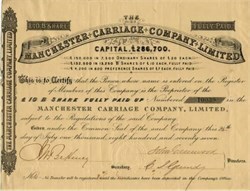 Beautifully engraved certificate from the Manchester Carriage Company issued in 1877. This historic document is hand signed by the Company's Directors ( John Greenwood ) and Secretary and is over 127 years old. Information from Lancashire Transport History.